Escape From Terra is approaching its 1,000th srip. That represents the better part of four years of five weekly strips. During that time, EFT has nearly always been listed as one of the top 100 most favorite web comics. Wow! We could not have done it without you. You took time out of your life to vote for us and we appreciate it. Thank you readers. We have really enjoyed bringing the EFT universe, and its characters, to life for you. However... Big Head Press has decided that in the current economy, it will have to concentrate its resources and efforts on Quantum Vibe. The EFT team accepts this and we continue to have the highest respect for Big Head Press for their support and cooperation over the years. Nevertheless, EFT will be comming to an end... or will it? 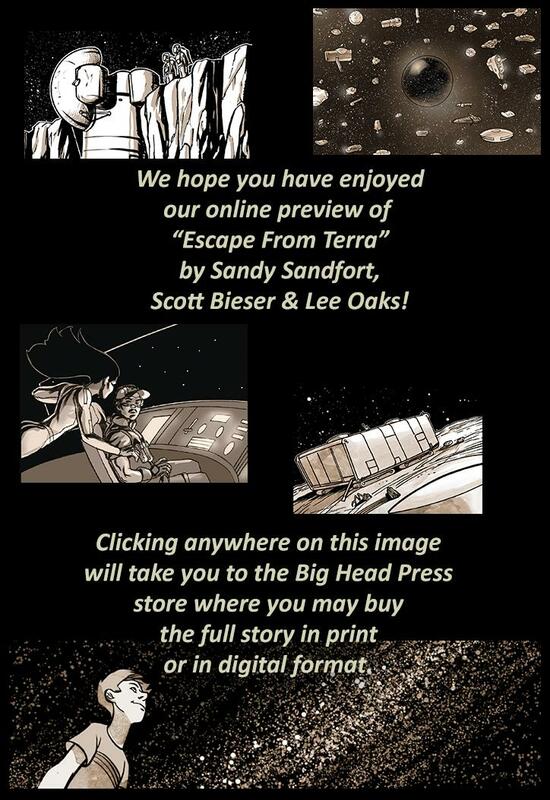 The EFT team, with the full cooperation of Big Head Press, is looking for a new home for EFT. Big Head has graciously agreed to continue the EFT forum during our search. New stories are not a problem. We have several finished, plus dozens of blocked-out new stories and hundreds of themes and ideas for years of entertainment. What we need is a new venue. Currently, we are in discussions with a traditional comic publisher about offering EFT as a monthly "comic book". These are the comics some of us grew up on, so we find the idea intriguing. In addition, we are exploring the possibility of offering a portable EFT app for smartphones. We might even offer EFT books internationally in various languages. There are many possibilities. It also occurs to us that we have the brightest and cleverest readers inthe world. So we would like to solicit your suggestions as t the best way to keep EFT alive and available. Please go to the EFT forum. P.S. If you would like to be notified about EFT plans and opportunities, please get on our mailing list. We will be setting up something a bit more sophisticated, but for now, just send Sandy an email (sandy@sandfort.biz) with EFT Mailing List in the subject line and we will put you on the list.